This passed Wednesday (August 2nd), nuBest salon and spa was featured on Fox 5 News for its new Sciton BBL SkinTyte laser treatment now available at the salon. 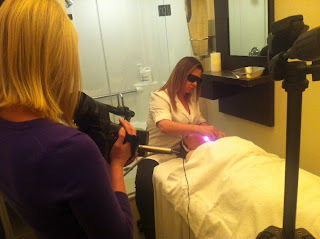 The camera crew visited the salon to learn more about the laser treatment. The Sciton BBL SkinTytle laser treatment is an innovative approach to tighten aging skin that is starting to wrinkle or sag anywhere on the body. It is most commonly used for "turkey gobble" that develops in the neck region but can also be used for the lower face/jowls, hands, stomach, arms and just above the knees. This treatment uses pulsed light technology to deeply heat the dermal layer of the skin's collagen, which promotes contraction and partial coagulation of the collagen, initiating the body's natural healing process. Following treatment, a new foundation of collagen is created leading to increased tissue forming. To learn more about this treatment, visit the website or call/visit nuBest with questions.